Two connected towers, with multiple restaurants and bars, make up the Sheraton Denver Downtown Hotel. One of these, the I.M. Pei tower, was an architectural marvel in its 1960s heyday. 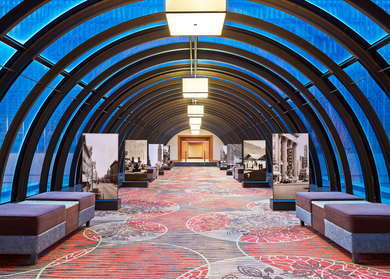 The largest hotel in all of Denver with 1231 rooms, the hotel also has major ballroom and event space offerings, too. The location on the 16th Street Mall, on the southwest end of downtown, also places this property near Civic Center Park, the art galleries at the McNichols Building (a former Carnegie Library), the Colorado State Capitol, and the museums of the Golden Triangle neighborhood. 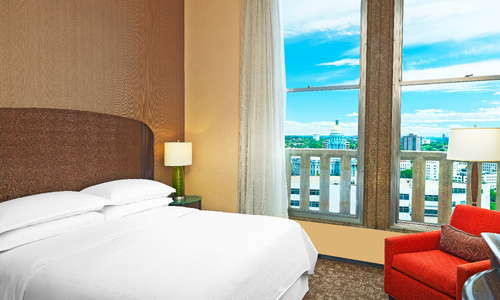 Rooms are clean and bright, with in-room safes, WiFi for a fee, large windows, and wonderful views from the upper floors. Club Level rooms are available, which give guests high-speed internet and grant access to a private lounge for breakfast, happy hour snacks and cocktails, plus sweeping city views. Suites and connecting rooms are also options. Bathrooms are standard, with accessible units available as an option. The lobby is situated in the main tower. 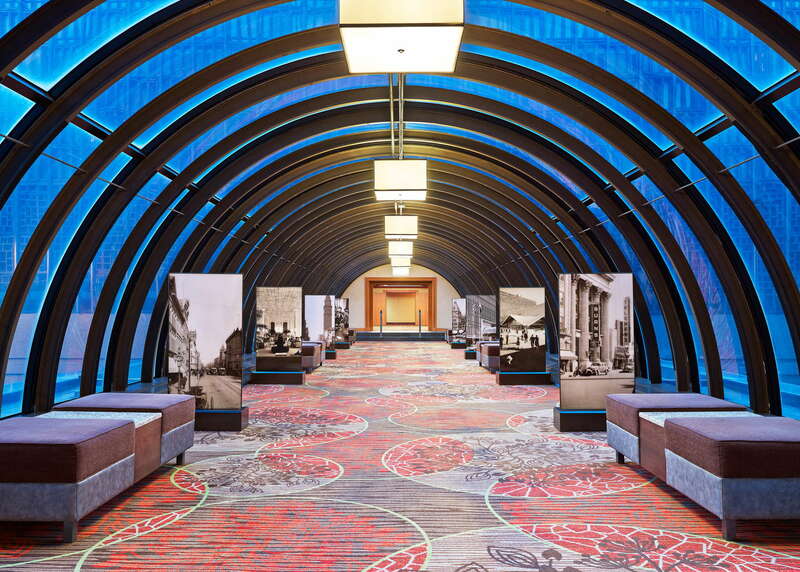 Once guests enter the hotel past the circle drive and admire the large bronze public art out front, they’re greeted by a large space, flanked by a business center, gathering spaces, and a bar area. 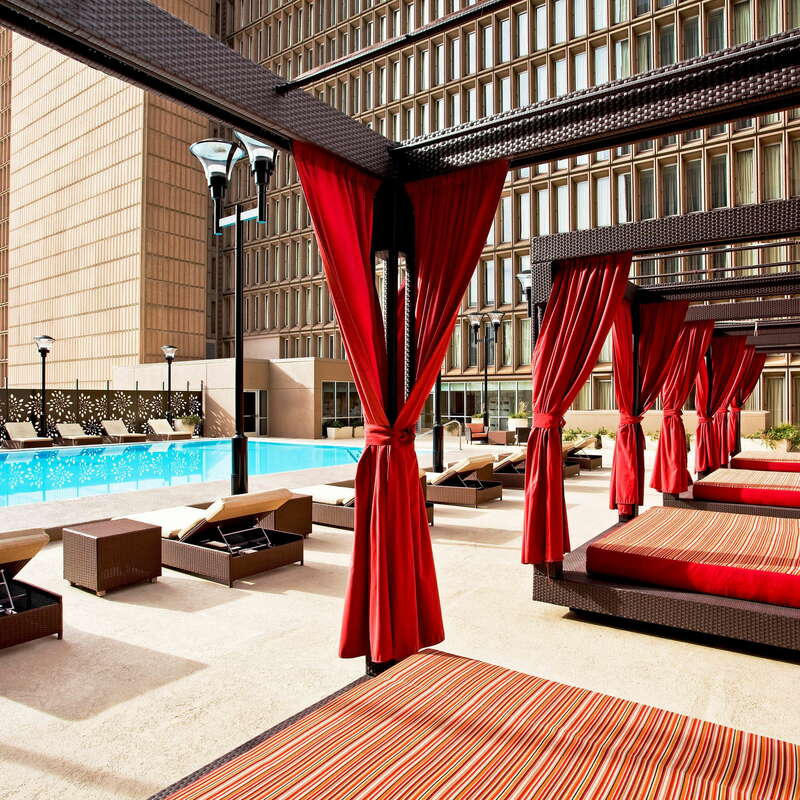 The outdoor heated pool is open year round, weather permitting. Loungers and cabanas surround the blue oasis, and guests are able to bring cocktails up to enjoy poolside. The 5,000-square-foot fitness center has no shortage of machines, weights, benches, or stretching areas. Water and towels are provided. The hotel has dining in spades. 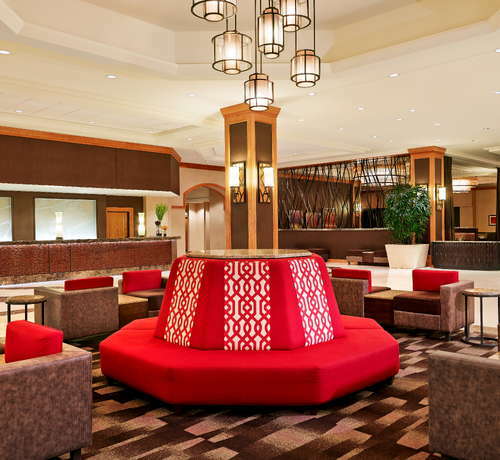 Guests can enjoy breakfast, lunch, or dinner at 15|Fifty, adjacent to the lobby in the main tower. Upscale casual cuisine can be found at Yard House—think giant, juicy burgers with gourmet topping options, sweet potato fries, hearty salads, and truffled mac and cheese. Zoup is a soup-only quick-serve restaurant with 12 daily offerings, including vegetarian, dairy-free, gluten-free, and other options designed with varying dietary needs in mind. There’s also a Peet’s Coffee & Tea on-site, for grab and go items or a quick caffeine fix. When the weather allows, pop by 16Mix, open from happy hour on, for a quick drink or light snack. Their patio is right on the 16th Street Mall for premium people watching. The Yard House has a beyond impressive beer list and the does extensive staff training with their employees to keep track of the bevy of rotating tap handles. The hotel offers both valet and self-parking options, but the 16th Street Mall pedestrian promenade and shuttles are right outside your door. The Sheraton sits on the edge of downtown, with easy access to the rest of the city center and also to the museum district just to the south. For breakfast, check out Denver institution Delectable Egg (1-minute), home to power breakfasts since the oil boom of the early 1980s. For locally-sourced American cuisine or a late-night appetizer with a side of live music, try Appaloosa Grill (4-minute walk). For funky decor, cajun cuisine, and deep-fried turkey, look no further than Bayou Bob’s (4-minute walk), in the historic Paramount Theater building. It’s a funny name, but The Greedy Hamster (4-minute walk) is known for their happy hour. A favorite among courthouse, city council, and Denver political types is Bar Red (7-minute walk). 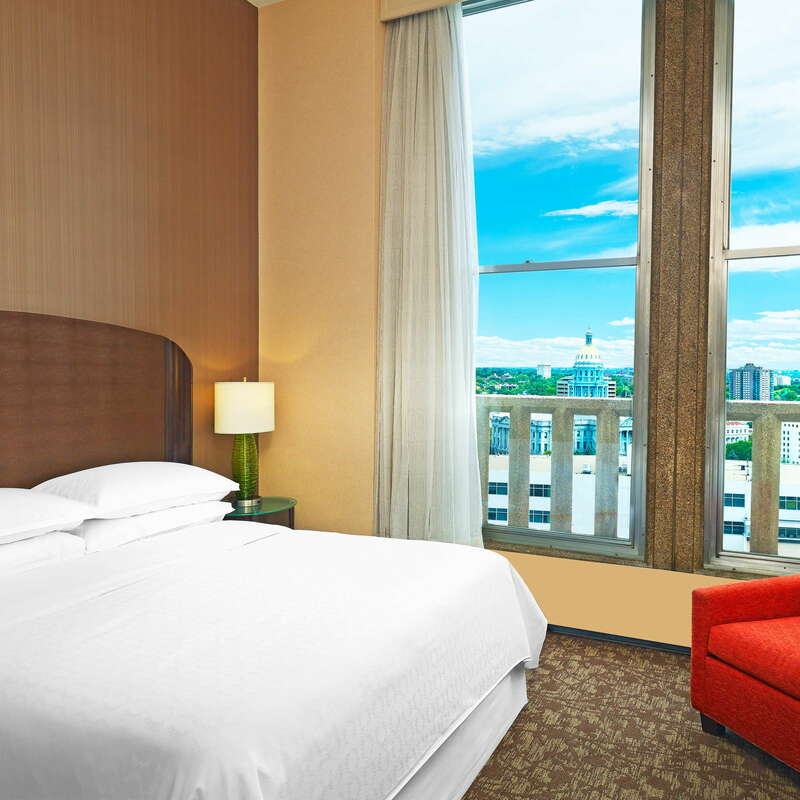 Though it’s a great choice for conventioneers and business travelers, the Sheraton Downtown Denver Hotel is a good bet for families and those traveling with dogs. 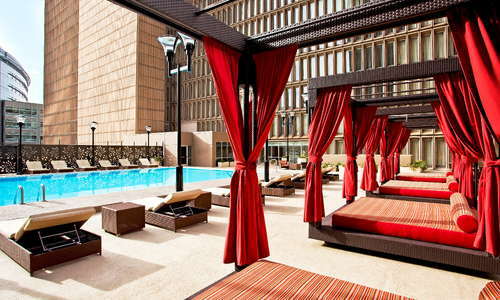 The location provides amazing access to area amenities, especially without having to rent a car. Travelers can leisurely stroll through Civic Center Park to the nearby museum area. As a bonus, the hotel is often on the parade route for Denver’s annual Parade of Lights each December. $$ &middot; 1600 Wewatta St.
$$ &middot; 1850 Wazee St.
$$ &middot; 233 Clayton St.
$$$ &middot; 934 16th St.
$$$ &middot; 1701 California St.